Learn how to use X-Mirage to AirPlay videos, music, or photos from your iOS 7 device to Mac/PC. 1. Make sure your iOS device and Mac/PC are on the same Wi-Fi network. 2. Swipe up from the bottom of the screen to access Control Center. 3. Tap AirPlay. Now you can see available AirPlay-enabled devices. 4. Tap X-Mirage[your Mac/PC's name], which is the default name, you can change it in the Settings panel of the interface. 5. Now when you view Photos, Music or Videos, contents will be streamed to your Mac/PC. 1. Connect your iOS device and Mac/PC to the same Wi-Fi network. 2. Open Videos, Photos or Music app on your iPad, iPhone or iPod. 3. 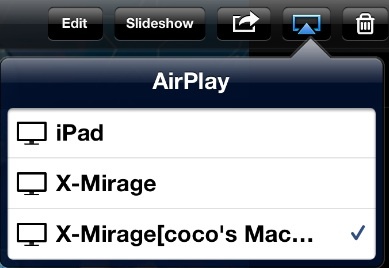 Find the AirPlay icon and tap it, tap X-Mirage[your Mac/PC's name], then the contents are streamed to your Mac/PC.